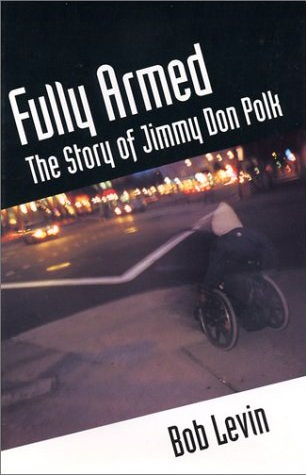 Fully Armed: The Story Of Jimmy Don Polk | The Bob Levin Dot Com. A lawyer named Bob Levin meets a disabled homeless panhandler named Jimmy Polk and decides to write his life story. Drugs, violence and the mysteries of the creative process. Out of Print. $25. signed. Only a few copies available. “A fascinating exploration of truth, friendship, and survival.” BOOKLIST. “…truly intriguing… a disquieting hybrid, a mystery story combined with philosophical meditation and self-probing.” EAST BAY EXPRESS. “Well structured and beautifully written… It deserves to be read.” PARK CITIES PEOPLE. “A riveting tale of unlikely friendship…” John Sanderson. ROCKY MOUNTAIN NEWS. “…a special example of creative biography…. “important.. (and) illuminating…” B.N. Duncan. STREET SPIRIT.